Christopher Robin Milne was born on August 21, 1920, so what better day to celebrate the world’s favorite bear! Winnie -the- Pooh was the name of the “Bear of little brain” in the stories created by A.A. Milne. 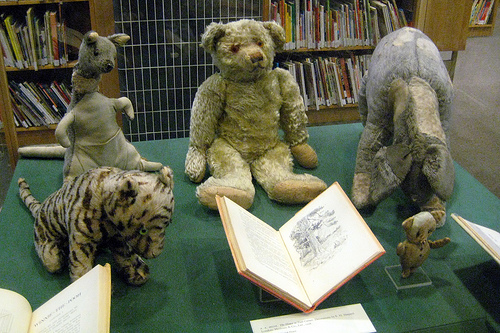 A.A Milne’s son Christopher had a teddy bear who Winnie the Pooh was created after. He named his teddy Winnie after a Canadian black bear he saw at the Zoo in London. The real life bear was actually from the town of Winnipeg. The “Pooh” part of the name was allegedly came from a swan that A. A Milne’s son saw while on a holiday. A black swan named Pooh also appeared in the Winnie-the-Pooh series. It was in1925 that Pooh officially came into being. Milne’s contribution for the Christmas Eve issue of the Evening News was a bedtime story that he had made up for his son about adventures he had with his Teddy Bear who was known as Winnie- the- Pooh. It was also at this time that the Milne family moved to the cottage at Cotchford Farm in Sussex which later provided the setting for the Pooh books. The original teddy came to America after the Second World War. He became a book-touring celebrity, eventually inspiring Disney to make him an international film star. He never returned to England and now receives about 750,000 visitors a year at his adopted home in the New York Public Library, where he lives in a bullet-proof glass case. The forest, where Pooh lived, is inspired from Ashdown Forest, near Hartfield, East Sussex, near to where the Milnes lived. It has its own Five Hundred Acre Wood, and although much of the area is privately owned, a local shop sells maps of the walk to Poohsticks Bridge, where you can still play the game of racing floating sticks through the arches . 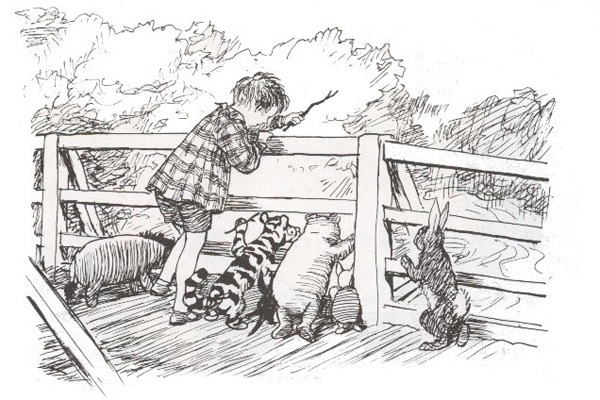 In the ‘sport’ of Poohsticks, competitors drop sticks into a stream from a bridge and then wait to see whose stick will float across the finish line first. Christopher Robin Milne was born August 21, 1920 in Chelsea. In keeping with Middle Class English tradition in the 1920’s, Christopher Robin was brought up by a Nanny who looked after him most of the day. He was taken formally downstairs three times a day to visit his parents. Small, and shy, much like Pigglet, Christopher Milne was clever with his hands. He loved sewing, knitting and making tapestry pictures. He dismantled clocks and locks, rigged up burglar alarms, and even turned a toy pistol into a dangerous weapon. In the late 1960s Christopher Milne recruited Pooh to help in the campaign for the survival of Ashdown Forest, which was then being threatened by the proposed ravages of a major exploration by British Petroleum. It was intolerable for Christopher that such wild, wooded English countryside, once the hunting ground of Kings, should come under the threat of so-called ‘progress and development.’ Happily, the 100 Acre Wood was saved for posterity. At the end of 1999 Pooh’s favorite bridge was forced to close after the wear and tear caused by thousands of visitors. In October till December that year the bridge was rebuilt at a cost of 46,000 pounds ($76,000) with the help of a 15,000 pounds donation from Walt Disney. 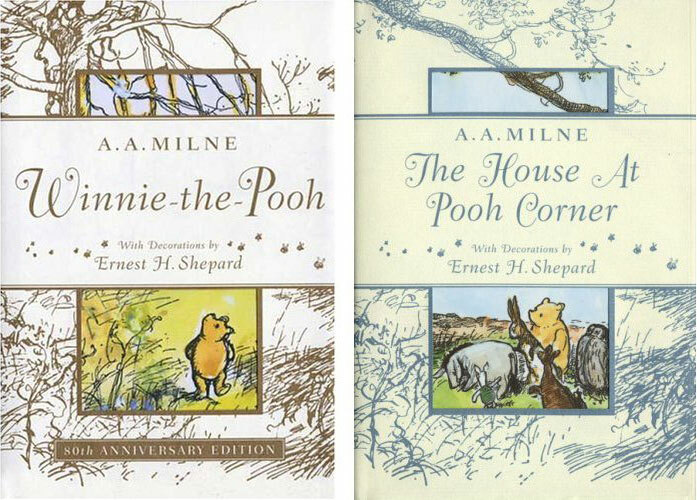 Over 100 Pooh books have been published by Dutton Children’s Books alone. Winnie-the-Pooh has been translated into over 50 languages, including Czech, Finnish, Yiddish, Afrikaans, and Esperanto. The Latin translation, Winnie Ille Pu, made the New York Times bestseller list in 1960 (the first foreign-language book to do so) and stayed there for 20 weeks. The popularity of Pooh has spread throughout the world and inspired adult works like the best-selling The Tao of Pooh and many children’s titles including: cookbooks, board books, cloth books for babies, and a beloved Disney character with its own line of toys, movies, and a television show. Sales of Pooh titles worldwide now exceed 50 million copies. Thank you Just Pooh for helping me filling in some gaps. For more fun facts I recommend you visit their site. I like the Pooh stories as much as I hate the Disneyfied version (however philanthropic the studio has been over the bridge): to me the animations and cartoons have none of the charm or atmosphere of the original. It won’t surprise you then to know that I’ve been compared to Eeyore (though I’ve never been attracted to the kind of role-play and readings students were wont to indulge in when I was at university). Even more than the Pooh books I love Milne’s poems for children. I was given a copy of The World of Christopher Robin in 1959: this was the collected When We Were Very Young and And Now We Are Six in one volume, and included new colour illustrations by E H Shepard and the fantastic dedication To Christopher Robin Milne or, as he prefers to call himself, Billy Moon…. My father bought it for me on my mother’s advice, no doubt because the dedicatee and I shared the same first name. I didn’t know the original Pooh had ended up in NYC. It’s interesting how Shepard simplified and morphed the bear into the delightful and unique shape that we now all know and love. Thank you for sharing your memories of Winnie. I grew up only knowing about the Disney version; even the books my cousin and I shared were drawings of the US version. It wasn’t until I had my son did I come in contact with the original. I found copies of the original books and like you, feel they are much more charming. I read them to my infant son. I love When we were very young and Now we are six. One of my best friend’s in high school was very Eeyorish. We teased her all the time over it. In my 30’s I read The Tao of Pooh and was not surprised to learn that Eeyorish is a personality type. When I was young, I’d say I was more like Tigger, bouncing from one thing to another. Now that I am olde, I seem to be turning into Rabbit; grumpily fighting with nature over my garden. Cultural conquest is a strange thing, isn’t it. Pooh with an American accent makes many a true Brit’s teeth grind — and Kevin Costner in Robin Hood Prince of Thieves has caused the loss of many a denture! — and yet the film industry (sorry, movie industry!) thinks nothing of giving ancient Greeks and Romans of a ruling disposition a refined British accent. And nobody, Brits least of all, remarks on the incongruity of it. Thanks! I think what keeps me young at heart is my love of variety. I enjoy learning. You know, I never considered Winnie’s lack of British accent. Sebastian Cabot narrated the Disney versions, his was the first British accent I fell in love with. It might make you feel better to know, we here in the states laughed at Costner’s Robin Hood because of his “accent”. We laugh at his eventual dropping of the pretense of an accent half way through the movie. But sadly, yes, many of us grew up thinking the Roman’s talked with British accents. We are a shamefully ignorant and ethnocentric country. When I was young, I loved Winne The Pooh. There was a time when I carried my little volume – illustrated by Shephard, of course – everywhere. This fine article was posted on “The View from Sari’s World” on August 21, Christopher Robin Milne’s birthday. It’s filled with interesting facts about the historical Pooh and Christopher Robin, as well as the real Hundred Acre Wood and Poohsticks bridge. Enjoy! Thank you for your kind reblog. I admire your blog so I am very touched you liked this enough to share. Winnie is timeless and I suspect for many of us who grew up with him is never far from our hearts.